Do You Need to Be Crafty to do Montessori? I am a mom with well intentions, but I struggle with organization, planning and as a pregnant woman, fatigue! I am also admittedly not that crafty. I will often opt to purchase an item if it will save me from the overwhelming feeling of crafting something. However, I really don't want my deficiencies to interfere with the type of quality environment I raise my children in. After reading many different Montessori books, I know this is the approach that I want to adopt for raising both my children. Me: You'll be happy to know I'm not the crafty type, either, and I'd much rather buy than make! It really helped that, when my son was born and until he turned four, I lived within walking distance to TWO children's consignment stores! I was also in two mother's clubs (great for free stuff), not to mention Craigslist and eBay! I never did buy those expensive Montessori infant materials, though. I just revised traditional toys using the Montessori Method (which I show in my infant tot program in various activities and documents). So don't feel like you have to craft beautiful materials, or buy expensive ones! Get what you can afford at garage sales, mother's clubs, rummage and church sales, and so forth. 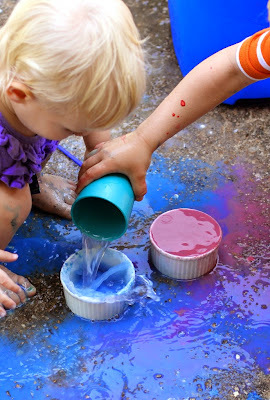 And if you do make some materials, like pouring for your toddler, it does not take any talent or much time! And I do buy Montessori materials, I just keep a monthly budget, as well as invite the grandparents to pitch in for them over Xmas and birthdays! Maria: "I'm not crafty but I use Pinterest for inspiration." Dawn: "I'm not crafty either, but the albums help (looking through the albums)." Erwin-Ashley: "No, but it helps! More than being crafty, you need to be inspired and resourceful." Torrie: "Not really... Thanks to good blogs out there you can get great ideas without having to think of it yourself." Hilary: "The only thing you need to be is open-minded. It's a learning process for parents and children. The more I learn about Montessori the more I am amazed at how resourceful I am myself. It's amazing to see us grow and learn together. Following the child has opened up a whole new world to me." Monica: "The "'not crafty'" thing is holding me back, I feel. Cutting, pasting, building, mixing ... it is just not stuff I enjoy doing which hampers me." Bertha: "I think any teacher, Montessori or not, needs to be a little crafty in order to follow children's interests as they evolve. You have to be able to improvise and be a little creative in order to get the most out of every lesson. I think more than crafty, creative." Julia: "Absolutely not! Montessori is about following your child. 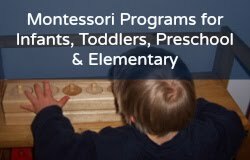 You can follow a Montessori philosophy without ever getting crafty or buying a single material. Heck you don't even have to ever do a tray! Just follow your child and provide for them to be nurtured in their love of learning." Skye: "No! Pinterest helps, but I find that including my kids in everyday life activities is the Montessori thing I can do! And yeah, my albums help a lot. I look to them tons."